The subscription-based Office 365 Home Premium will give 5 people access to the full Office 365 features ( Word, Excel, PowerPoint, OneNote, Outlook, Access, and Publisher) via their individual accounts. For the privilege they will have to fork out $99.99 a year. Office 365 Small Business Premium gives organizations of 1 to 10 people the same access with each employee getting to use 5 PCs. The service will set businesses back $149.99 annually, which makes $12.50/month. 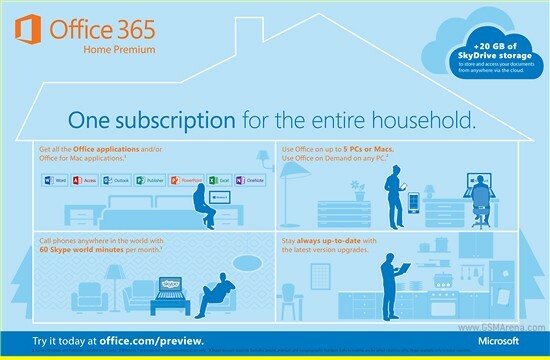 Both Office 365 subscriptions will be available in physical and online stores and resellers. Office 365 Home Premium will be offered across 227 markets, while Small Business Premium will be available throughout 86 markets. If you prefer to purchase the regular Office 2013, you should know that its prices are starting at $139.99. If you plan on getting a Windows RT tablet however, you better not rush with the purchase as Office Home & Student 2013 RT will come preinstalled on all Windows RT devices with full-featured editions of Word, Excel, etc.